Before problems with your residential driveway begin to spiral out of control, take the time and understand your options. 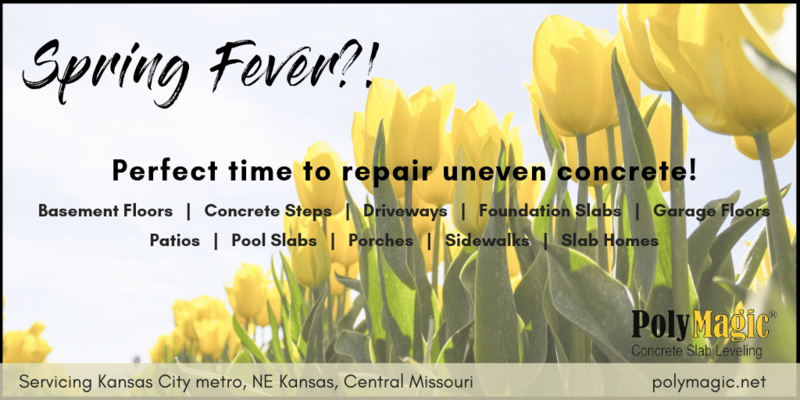 Carve out a bit of time to speak with a reputable concrete repair company in the Kansas City area that will help you reap benefits long-term. Check out the 3 Signs Your Driveway Needs Some TLC. The most obvious out of the 3 signs your driveway needs some TLC is visual cracking. Concrete cracks can be a result of many factors, including the freeze/thaw cycle, foundation issues, deep tree roots, and even heavy machinery or equipment. Cracking can be a gradual process, but with the temperament of a below freezing midwestern winter, the cracking can be sped up. With the winter the Kansas City area had this year, any hairline crack has probably grown and magnified in length and width. 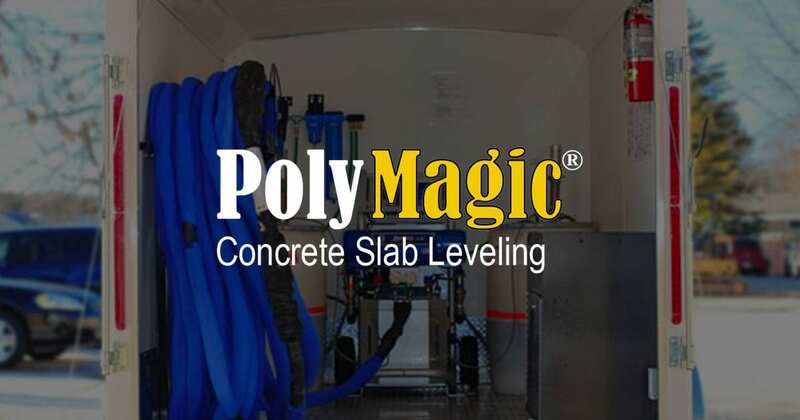 The crew at PolyMagic has the experience of construction and concrete repair within the Midwestern region. Let us check out your problem areas and provide an honest quote. When your concrete slabs, driveways, and steps become uneven and begin to sink, a cost effective solution for many concrete repair companies is mudjacking. This is a suitable way to lift the concrete, but the evolution of polyjacking has shown greater advantages compared to that of mudjacking. The process can also be known as mud jacking, concrete raising, concrete lifting, or slabjacking, and is a technique that involves injecting concrete material below the sunken concrete, raising it to the point where it is level again. When looking for a reputable company near you, you should do your homework. Take some time to pull up google reviews, get multiple quotes, and ask the company for references. These three elements of the homework phase will tell you a lot about your decision to proceed with the company. Trip hazards are a sure sign that you need to give your driveway some TLC before someone gets seriously injured. Repairing the driveway doesn’t need to be an elaborate process. PolyMagic even makes it so easy that you can simply upload a few project photos of your problem areas to the quoter form, and we’ll get back to you with a more accurate estimate. Uneven concrete is many times overlooked by homeowners until the problem becomes a dangerous tripping hazard or when it’s time to resell your home. 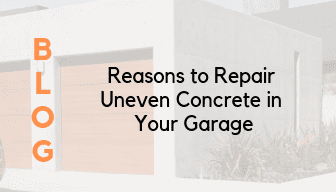 Let’s explore some reasons to repair uneven concrete in your garage to eliminate headaches and unsafe areas on your property. One of the main reasons for repairing uneven concrete is for safety purposes. 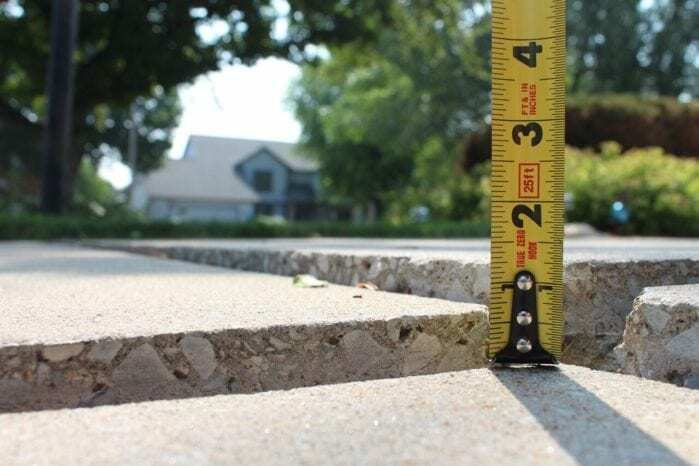 When concrete becomes uneven, or crumbles, it can become very dangerous and result in tripping hazards for residents and visitors to the home. Your home insurance policy may even require this type of repair be completed to remain compliant with the policy coverage. The last thing you want to happen is for someone to fall on the uneven surface within your garage, resulting in more problems (monetary and safety) than what it would take to find a reputable company to mudjack or polyjack the concrete. Investing in your property, safety, and resell value are all many reasons to utilize a concrete slab repair company. The unevenness of the concrete in your garage will likely result in further damage to your foundation and concrete slab. The longer the uneven surface is left untreated and not repaired, the longer the amount of time for water and even freezing temperatures to further crack the concrete. The optimal time for repair is when you begin to notice the uneven surface. Many reputable concrete repair companies, such as Kansas City’s PolyMagic, will provide free quotes. PolyMagic even takes it a step further with their online quoting functionality. You are able to upload images of your problem area to their online system (https://www.polymagic.net/request-a-quote/) and their experienced team will review the project and offer a quote. Check out this time-saving tool! Another one of the Reasons to Repair Uneven Concrete in Your Garage is that uneven surfaces is the perfect spot for water puddling. Just like a flat roadway, when you have dips and uneven surfaces and it rains, the dips fill with water, creating puddling. Within a confined area such as a garage, the moisture tends to stay inside of the uneven surfaces and cracks, causing additional issues. 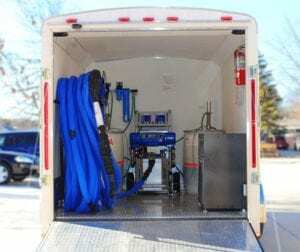 If you live in an area with climate changes, specifically freezing temperatures, the collection of water, turning to ice, can be a major issue. The ice causes the concrete to expand, resulting in more serious issues. Kansas City’s PolyMagic is one fo the companies that has extensive experience with repairing uneven concrete surfaces resulting from ice repair. Are you ready to take the next step and get a quote or reach out to a mudjacking or polyjacking company in your area? Here are some tips for finding the right match for your needs. Finding a Concrete Repair Company in Your Area can be a time-consuming process. One of the most effective and precise ways to find a reputable, reliable, and experienced mudjacking/polyjacking company is sifting through their Google Reviews. Many companies have less than 10 reviews, which really won’t give you a true understanding of the full experience. However, one specific Kansas City-based concrete repair company, PolyMagic, has over 35 reviews to date, with a 5-star rating! The reviews all have a common theme, which highlights the honest, hard-working and knowledgeable team that comes out, on time, to complete the project right the first time. Time seems to be the common theme for PolyMagic! We’re here to save you time! Check out the latest google review from a customer about his experience! Want to check out some garage floor repair before and after pictures? Click here! Check out this before and after at a daycare in the Kansas City area that PolyMagic just completed. Uneven concrete is a tripping hazard, so the playground at this childcare needed to be brought up to a safe surface. Do you have an uneven driveway, sidewalk, porch, basement, garage or concrete stairs? Ready for a free quote? Get started today! When it comes to concrete repair, many homeowners interchange the terminology between mudjacking and polyjacking. Let’s take a look at the process of both, and focus in on the advantages of mudjacking. Polyjacking utilizes polyurethane injections, which are much lighter than the grout mixture used in mudjacking. Concrete slabs settle due to a void underneath them. Mudjacking is a process that raises and levels sunken concrete, eliminating the need for concrete replacement. Mudjacking utilizes a grout mix of mudjacking is inserted between the soil and the concrete slab. The process begins by drilling a 1 5/8 “diameter hole(s) through the top of the existing concrete. (The holes are the diameter of a Snapple bottle cap.) The number of holes and their placement depends on the size of the piece to be raised. A mud slurry is pumped into the hole(s) in the concrete. The hydraulic pressure raises up the concrete until it is at the desired level. After the concrete is raised, the hole(s) is plugged with a foam plug, the concrete surface is cleaned, the foam plug(s) is pushed down, and the hole(s) is filled with concrete. The shear weight of the mixture can cause additional settlement. Polyurethane weighs 250 to 300 pounds less per yard then traditional mudjacking material. If you are considering concrete replacement, and are unsure which form best suits your needs, PolyMagic can assist by assessing your situation. You are able to upload some pictures of your problem areas to the quoter form, and we can review, assess and provide a free quote to you. Get started by clicking here to begin the short quote form. Let’s explore the advantages of mudjacking. The first and main advantage is the cost savings. Mudjacking is generally 1/3 to 1/2 the cost of concrete replacement. Our experienced team can finish most jobs in a matter of hours in a single day. The mudjacking process does not require disturbance to existing landscaping. In contrast, replacement is a lengthy procedure. It requires demolishing and removing the existing concrete, recreating the concrete bed, and pouring. New concrete takes days to cure and dry before use. The process of mudjacking requires several experienced employees, heavy materials and equipment to complete a project.When determining the most effective method of repairing concrete, trust the experts. 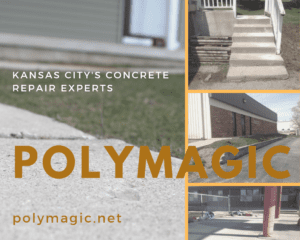 Not all concrete repair companies are created equal, so it’s important to rely on an experienced company, like Kansas City area’s PolyMagic. Another advantage of mudjacking is that the concrete will not be mismatched, as it would with replacement concrete. The concrete will remain consistent with the same color and texture as the original. Uneven concrete is not only unsightly, it also creates a tripping hazard. When you choose to raise existing concrete, you also eliminate the need to match color and pattern with the non-damaged sections. Excellent job On time Looks great Reasonable price and fair contract. No unpleasant surprises. I got bids and terms from other contractors. Save your time. These guys seem the best. Very cordial and easy to work with. I especially liked that the guy who does the actual work was the one estimating the job. Jerry Fox was very professional and he left the area he worked on clean and nice. I didn't have any problems. I noticed my driveway had dropped several inches and I was referred to PolyMagic by a coworker. This was the best call I've made. The work was done fast and looks great. I hope I dont need this done again but if I do I will definitely use this company again. Jerry did the work to raise my steps from settling. He was great & talked me through what he was doing & fixed everything as it should be. Looks great. Very pleased. I would recommend this company in a heartbeat. In this day and age, when so many companies don't fulfill their work, or treat you like you're just money in their pocket, PolyMagic goes above and beyond to satisfy you, stand behind their work, and treat you like a friend. I had A young man, named Jerry Fox, come out last year, and poly-jack my sidewalk and pillars on my front porch, where they had settled into a void. They did a wonderful job, were polite, and fulfilled all the questions I had. Well, with this terrible drought that we've been in this past summer, my pillars on my porch started sagging again.....I made a call to Vince, the owner, sent him pictures of what was going on, and, he sent Jerry back out. Not only was he here exactly when he told me he'd be, he took care of my problem at hand. No extra charge.....they stood behind their warranty from the work they did last year. Now, not only is the drought not their fault, nor the soil pulling away, they felt like they needed to stand behind their work. I give Jerry and the company 5stars, and, beyond. Thank you, guys! Jerry was very professional. He explained everything thoroughly. He was punctual and even got me on the schedule sooner than expected. Very happy with his work! Working with Jerry has been extremely positive. He is a hard worker, is easy to communicate with, and pleasant to deal with. Our job had some challenges and the team worked hard to find the best fix! I highly recommend them. I cannot say enough good things about working with this company! Vince and Jerry were very professional and offered remarkable customer service. I called PolyMagic in a panic as we were in a rush to get paperwork for closing after getting the run around from another company. Right away, Jerry was on site for an estimate and they got paperwork to my lending agent almost immediately. Jerry showed up on time and completed the work in the rain with no complaints. Great job, guys! We are thankful for you! Jerry was on time to the house. He took his time to make sure everything was going correctly. He answered all my questions. He cleaned up the area where he worked. Jerry did not go over the amount of poly he quoted which was great. If I ever need any type of this work done again somewhere else I would use Jerry with PolyMagic. Easy process beginning with my first contact to PolyMagic, to the bid and through the actual work. Jerry was on time, professional, friendly and educated me on the process and his work was meticulous. We’ve had traditional mud jacking in the past with another company, which proved to be only a temporary fix. Jerry’s product and process seems to be the right solution for our problem of a sinking sidewalk. I’m glad we found PolyMagic and put our trust in their services. I recommend them without any reservation.